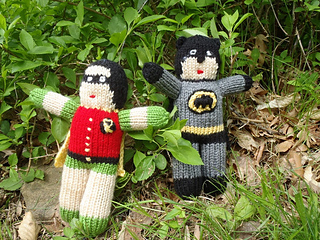 This is Batman and Robin inspired knitted toys. 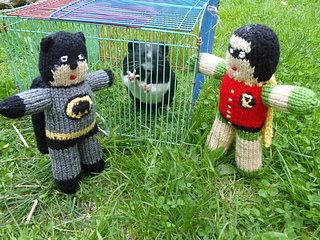 Both toys are knitted from bottom to top. Starting with one leg, then second, joining the two legs together, continue through body to the top of head. You will use some intarsia in the round for the face features, and some embroidery. 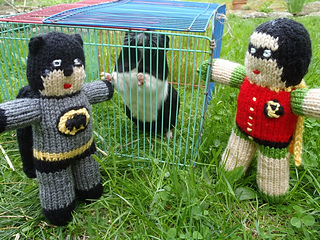 The cape is attached by picking up stitches and knitted flat. 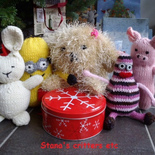 The arms are knitted separately then sewn on, or you can just pick up the stitches directly on the body. When casting on leave a longer tail to be used for sewing.